Our marine life - sharks, manatees, turtles, dolphins, fish and the tiny coral polyp - attracts many visitors to Belize. Should seeing them up close within arms reach be so important to our success that we must change their natural behavior? When wild marine life becomes accustomed to human interactions, their natural hunting instincts and fear of humans decrease, which can result in their demise. The feeding of marine life has resulted in the death of a well known green sea turtle, and has made sharks and rays as eager as puppies at the thought of a handout. If encountered outside of a feeding area, they would perhaps be curious for an instant and then likely flee rapidly away. Tour guides are touching and handling sharks and rays and encouraging their guests to also touch. Tour guides are also permitting their guests to touch manatees and sea turtles. Nurse sharks, manatees and sea turtles are protected by Belize laws, which prohibit harassment. Tour boats are operating at high speeds in critical manatee habitat. In 2017 there were at least 14 manatees killed in the Belize River, their deaths likely caused by a tour boat traveling to see manatees. Tours need to be designed to enable viewing of wild life, but to not cause harm to the very creature that many operators and guides rely on for their livelihoods. Visitors need to be educated on best practices for wildlife interactions and patronize operators that respect wildlife. In many cases feeding and touching marine life has become common place and is condoned by authorities. Authorities need to review these activities, and either enforce the regulations or amend them to allow feeding, touching and operating at reckless speeds in critical manatee habitat. If we would like to continue to benefit from the natural wealth untold Belize's seascape offers, then we should work towards treating wild marine life with respect and admire their natural ways, not altered by feeding, and respect and protect critical habitat. What's acceptable and what's not? Please share your views and submit your vote below. There are less than 1000 Antillean manatees in Belize. Manatee tours are very popular in Belize and visitors enjoy seeing them on their trips. There are places where manatees are regularly encountered while snorkeling on the reef and these interactions should have "best practice" guidelines to minimize negative impacts on manatees. What's acceptable and what's not? Is it acceptable to provide turtles with food in both instances described above? 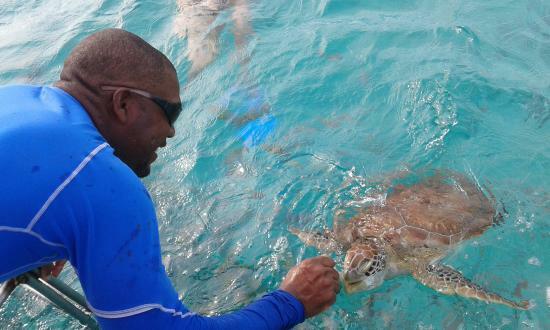 It would be easier to ask guides to stop feeding the turtles then to ask fishermen to stop throwing the lobster and conch guts back into the sea. Could the fishermen be asked to clean their product at specific sites that tour operators could take their visitors to? 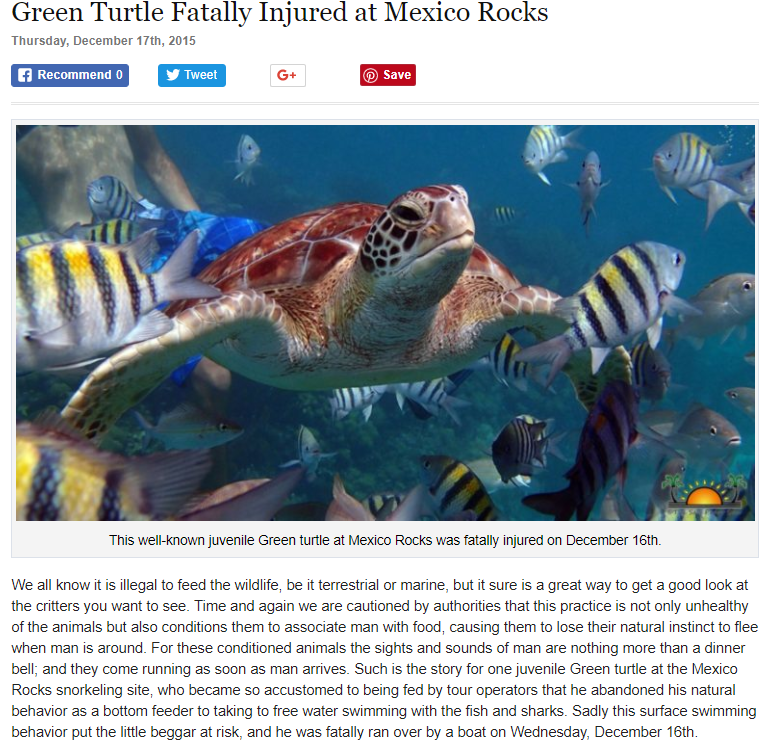 In this way visitors would still be able to see turtles, but guides would not be feeding. Now officially part of Hol Chan Marine Reserve, a juvenile green turtle was regularly fed here by tour operators and their guides, and was run over by a boat and died as a result of the injuries. 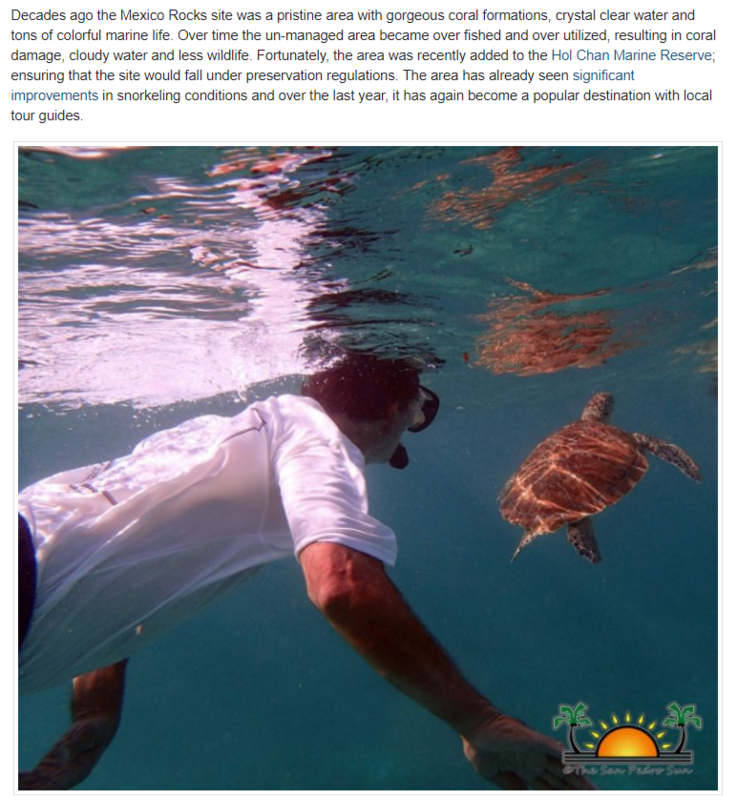 Here is a picture of a guide feeding the turtle, and below an article by San Pedro Sun on the efforts of the Hol Chan Marine Reserve to discourage operators and guides to feed marine life as it changes their natural behavior. 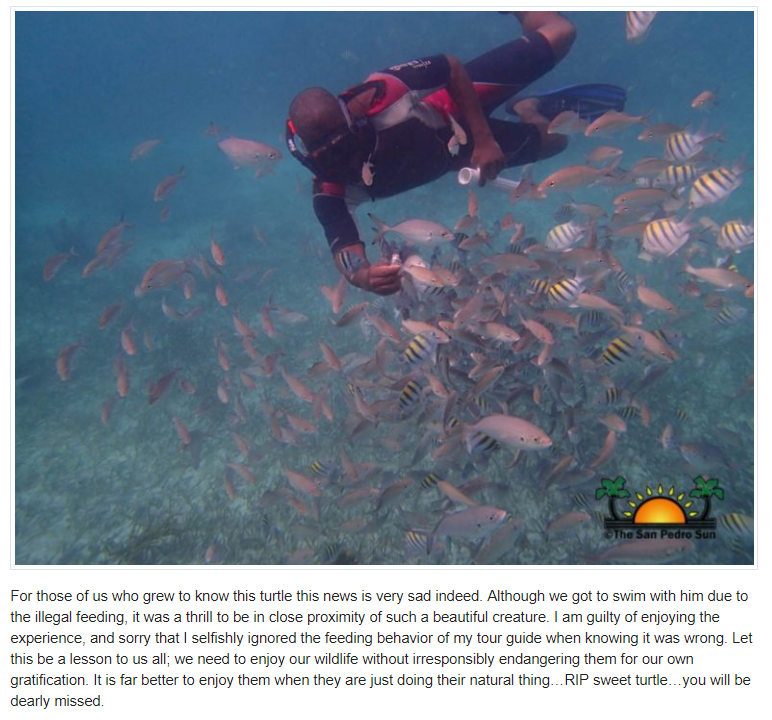 "A few aggressive, but harmless sea turtles." At Shark Ray Alley it is permitted to feed marine life, but some guides also handle the sharks (and rays) and invite their guests to also touch the wildlife. Recently nurse sharks became protected. Is feeding OK, but touching and handling not OK? Or is both feeding and handling/touching not OK? If feeding and touching are OK at Shark Ray Alley, should it be ok to feed and touch at other sites?